Bigbsy Shadington's Wonderclaw is an NC Mall game based on arcade claw grabbers. As with JubJub Power Bounce and Blumaroll, you'll need to purchase widget packs with Neocash, which requires real money. This game does not award any Neopoints and therefore can be played on side accounts. New machines and prizes will be available once in a while. Be sure to check out the game's FAQ before playing. These are the currently available widget packs that you can purchase in the NC Mall to exchange for game plays. You'll need to obtain a widget (1-pack or a multiple pack) from the NC Mall and activate it in your inventory, using the "Activate" option. After activating a Widget, it will not expire. 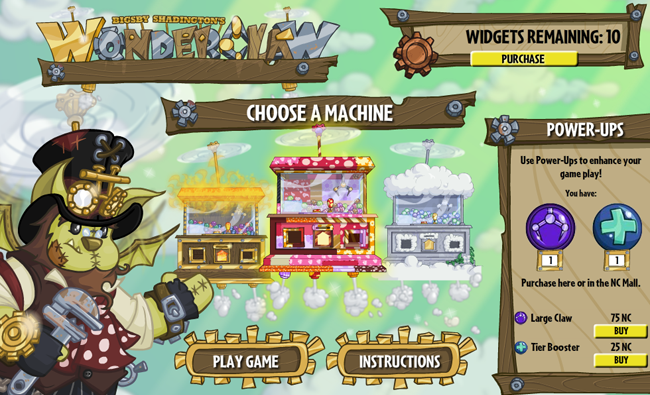 Once you are inside the game, you'll need to choose a machine to play on. "You chose the theme Machine! Are you sure you want to use one of your widgets?" At which point you can always say "no" to choose a different machine. Load up a widget by dragging it from the top right into the widget slot. At this time, you can also choose to use a Large Claw Power-Up if you have one. 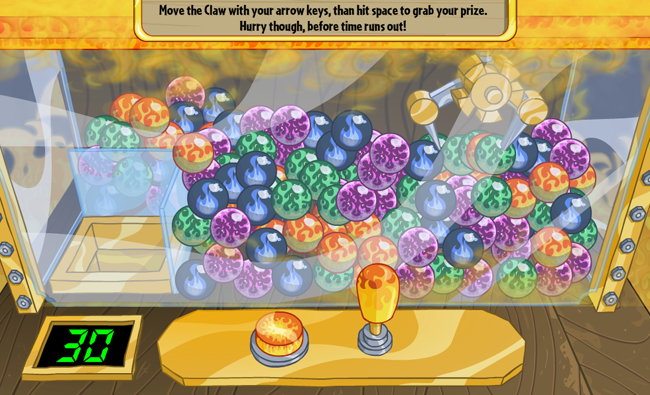 Use your arrow keys to move the claw around and press the space bar to grab a prize pod. If you do not do this within 30 seconds, the claw will automatically descend and grab something for you. The colour of the pod does not affect the prize you'll receive. Click on the selected prize pod to claim your prize. You can use a Tier Boost Power-Up at this point to change your prize to an item from a higher tier. Once you've received your prize, that is the end of the game and you can use up another widget to play again if you want. If your game freezes or you accidentally exit, you can come back to the Wonderclaw page and resume (it won't take an extra widget from you). Within Wonderclaw, there are two power-ups that can be purchased from the NC Mall to enhance your game. When playing a widget, you'll have the option to use an activated power-up, or you can choose not to (by selecting the "No" button that pops up). Once purchased, power-ups do not expire and will not go into your inventory; instead, they will be added to your in-game power-up tally. This also means that you are unable to gift the power-ups to other users. Upgrades the prize you receive at the end of playing a widget. For example, if you grabbed a wood tier prize, your power-up would boost the prize up to a random item from the bronze tier. You only receive the upgraded prize item. This power-up cannot be used if you initially grabbed a gold tier prize. Enhances the claw so that you are guaranteed to pick up two prizes instead of one. The two prizes may be from different tiers. You may still use a Tier Boost Power-Up on any of the two prizes you get. Below are the list of current prizes, sorted by machine. 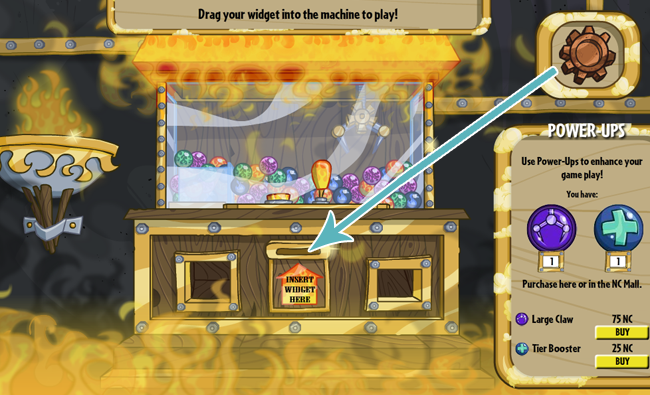 Regular prize pods come down the chute on the right side of the machine. If a golden prize pod comes down the left-hand chute, you'll receive a special bonus prize as well as a gold tier item. This page was last updated on January 31, 2019.